I really love Indian flavors, but usually cheat on weeknights by using simmer sauces purchased at the store. While not gourmet, they really are quite delicious and it honestly doesn’t get much easier than throwing chicken breasts into the skillet and pouring sauce over them. But those are for weeknights when I’m exhausted or for when we are completely out of groceries (simmer sauce is on the list of my staples, along with dried pasta, rice, chicken breast, black beans, etc.). Weekends call for real Indian food. From scratch. And making my own ghee. Let’s start with the ghee. Ghee is a browned clarified butter with a rich, nutty flavor that’s often used in Indian cooking. You can buy ghee at Indian grocers…or you can make your own for a heck of a lot cheaper! Just make sure you keep an eye on it. Mine went from almost done to burnt in the about the 30 seconds it took me to walk over to the pantry to gather ingredients. Whoopsie. Place butter in a medium saucepan over medium-low heat. Cook 20 minutes or until solids have turned a nut brown, stirring occasionally. Skim solids from surface of melted butter; discard solids. Slowly pour remaining butter out of pan, leaving remaining solids in pan; discard solids. And now for the Dhal. This is FANTASTIC served with warm, fresh naan, a dollop of yogurt, and coriander chutney (this I did buy from the grocery). This dish was incredible and is extremely filling as well. My Indian friends at work were really excited when this showed up in my lunch box, so it must at least smelled and looked legit! Enjoy! Heat 1 1/2 teaspoons Ghee in a large saucepan over medium heat. Add onion, carrot, and garlic; cook 5 minutes. Stir in broth and next 7 ingredients (through peas); bring to a boil. Cover, reduce heat, and simmer 1 hour, stirring occasionally. Place mustard and cumin seeds in a large nonstick skillet over medium heat; cook for 1 minute or until toasted. Add remaining 3 tablespoons Ghee; cook 1 minute or until seeds begin to pop. Stir into soup; serve immediately. This does look fantastic and I haven’t had Indian in too long. Yummy! this looks great. I love a good Indian and this is one of them. 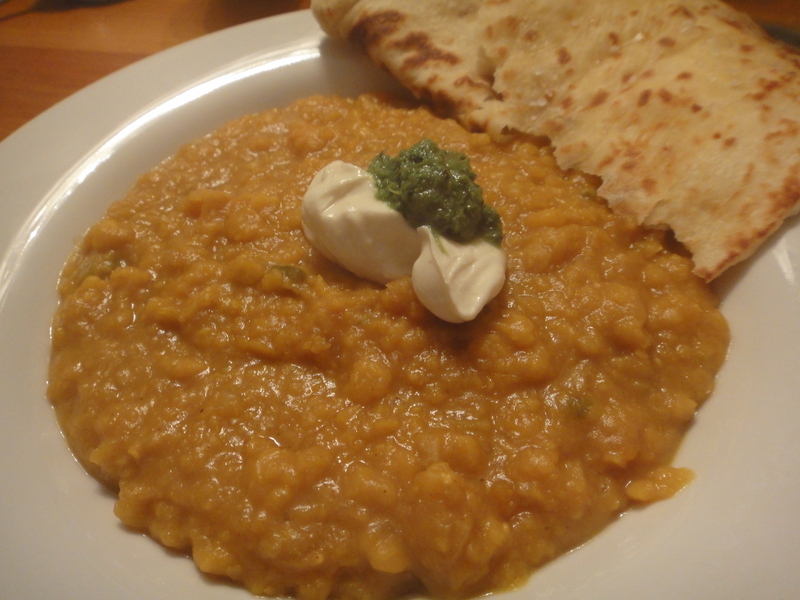 Dhal is truly one of my favouties as I adore lentils and split peas.